We were very lucky to have collected our new SZ5 today from Stoneacre Lincoln. We drove it back to County Durham so it’s already clocked up around 150 miles. The dealer was excellent and gave us half a tank of fuel and mats in with the price. The only extra I paid for was diamond bride paintwork treatment which comes with a really nice care pack. - visibility is fabulous, I didn’t find the rear tyre getting in the way like some have. Mirrors are huge so easy to see everything behind. Excellent mate! Stunning motor. Must feel GREAT to pick her up. Congratulations, glad you are enjoying it! It really does change your driving style if you have not had one before, but not in a bad way. It does make you enjoy the drive more. I'm up near Consett and got my silver SZ4 at the start of February. Still yet to see another Gen4 on the road. Not far from you at all we are in Copley, will look out for you. Took the Jimny racing today at Croft. Well not to race but watch. I can see lots of people pointing and saying it’s one of those new Jinny’s. You are obviously new to Jimny's. It is heaps better in all respects than the older models. 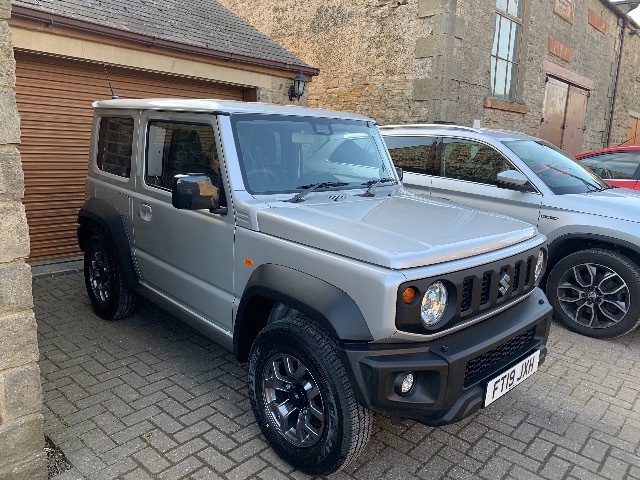 Welcome to the Jimny Clan.